The brilliant careers of Ricky Dobbs and the rest of the Navy seniors ended with a 35-14 loss to San Diego State on Thursday night in the Poinsettia Bowl. The Aztecs offense had too much firepower for Navy’s defense, finishing with 555 total yards. Freshman running back Ronnie Hillman led San Diego State’s attack, rushing for 228 yards and three touchdowns. Hillman also caught a touchdown at the beginning of the fourth quarter, which was effectively the back-breaker for Navy. Aztec junior quarterback Ryan Lindley threw for 276 yards and two touchdowns. For Navy, Dobbs has a typically strong game leading the option attack, grinding out 108 yards and running for one touchdown and throwing for another. On defense, however, Navy could not get pressure on Lindley and forced no turnovers. Aztec wide receiver Vincent Brown scorched the Mid secondary in the first half and finished with 165 receiving yards — 143 of which came in the first quarter. Navy finishes the season 9-4, highlighted by wins over Notre Dame and rival Army. 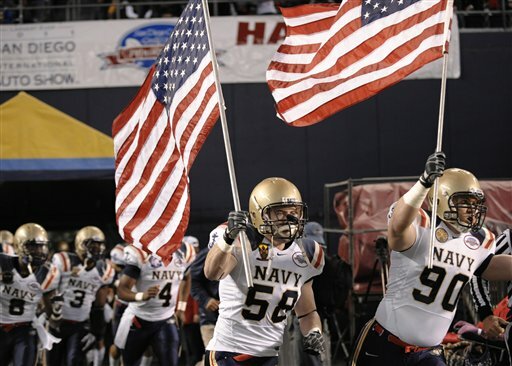 This was Navy’s eighth-straight appearance in a bowl game, a program record.